Have you all dine in the dark before? We all heard a fair bit about the concept of dining in the total darkness, haven't we? I think NOX need no further introduction. 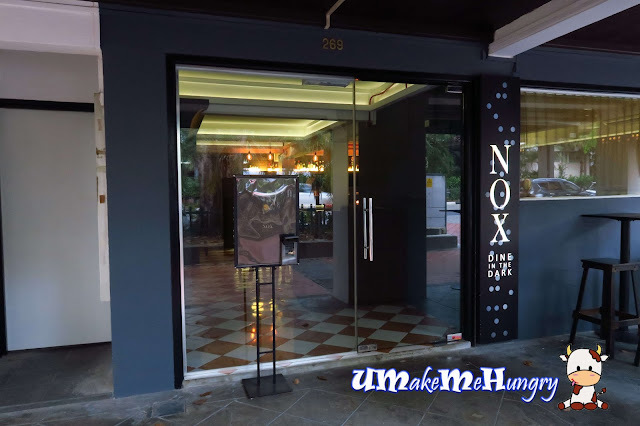 NOX is located along the shop houses of beach road occupying 2 level of shop space. The service staff welcomed us into the lounge and gave us a drink menu to choose upon. The moment I sat down, the plushy sofa seat reminds me of Gold Class Cinema lounge, quite similar in a sense. 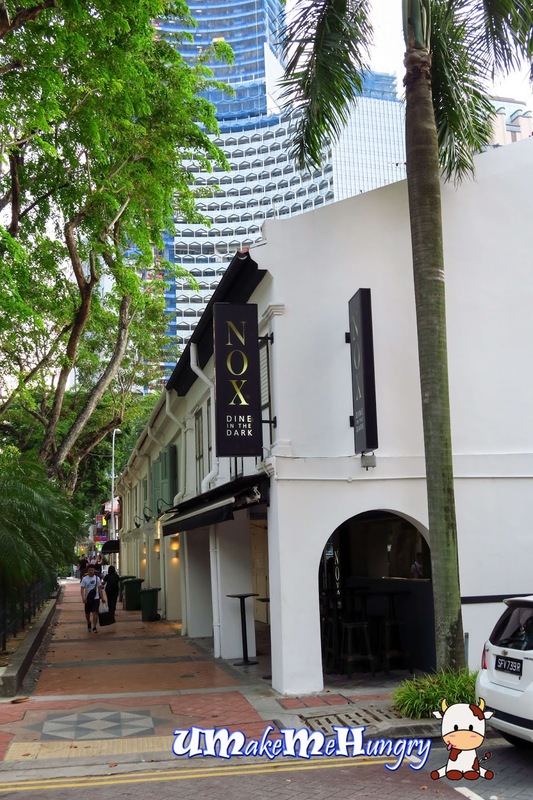 Servers explained there is no food menu to choose from, rather there is a secret menu at $88++ per pax that consists of 12 dishes spreaded into 3 courses, appetizers, mains and desserts. Restaurant menu will be change every 6 - 8 weeks and should you have any dietary preference, e.g. vegetarian, please highlight to them. A citrus combination of orange with a bittersweet finishing taste from a pomelo. Its more sour than sweet per say with grapefruit, lemon juice, simple syrup and Grenadine that give a tart and sweet flavour to the naturally sour fruit. 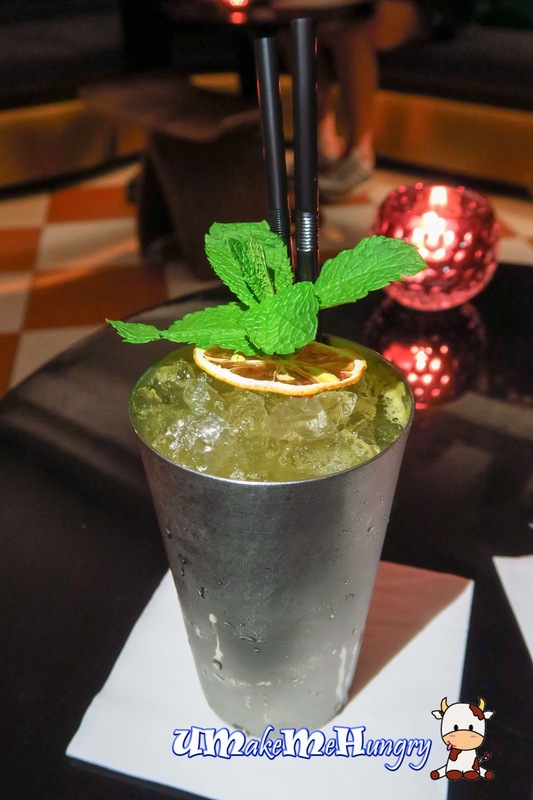 The zesty and minty flavours make this quencher such refreshing. Out of 3 drinks tasted, I rate this the best. Ingredients were close to other drinks with passionfruit, simple syrup, lemon juice, lime juice, fresh mint leave and ginger ale. Being described as not the ordinary strawberry milkshake, it really make me wonder how does it taste like. 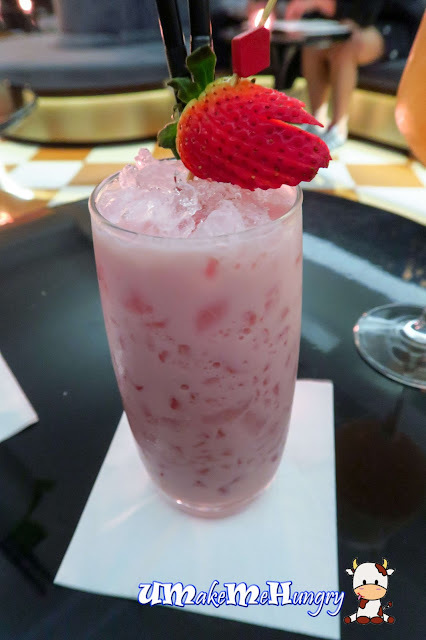 Drink was milky pink served with little ice cubes and a strawberry. 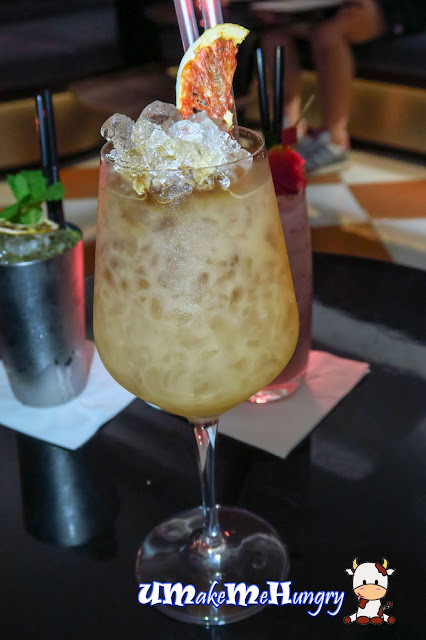 It was more of sweet and less of the sour taste with fresh milk, vanilla syrup, simple syrup, lemon juice and Amaretto Almond Syrup. 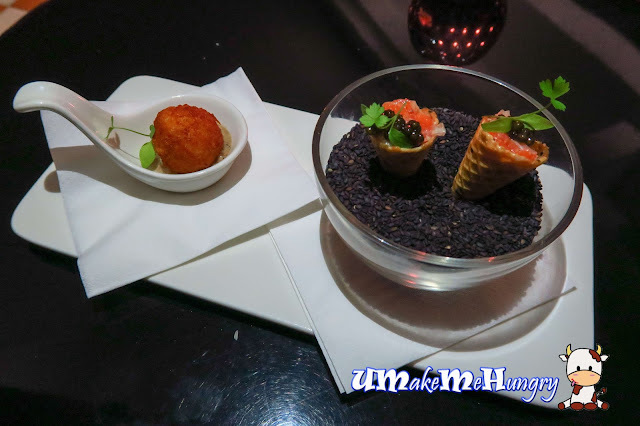 We were served with the starters with a vegetarian on the left and 2 mini cones on the right for the non vegetarians. The fried vegetarian had a pleasant scent of truffle oil smell and looks good with its creaming sauce at its base. Starters for the non vegetarian was miniature. 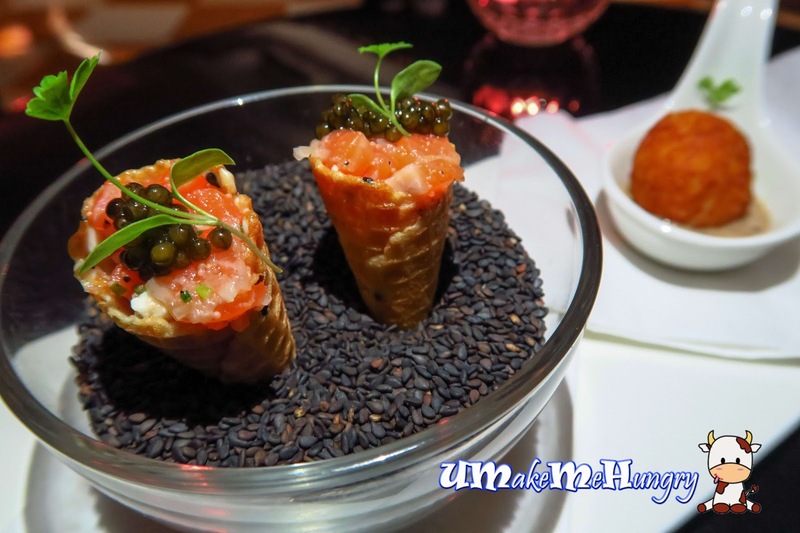 Raw salmon was served in the tip of the ice cream cone biscuit added with caviar. The presentation which depicts some plants on the soil had totally taken me away. We was told not to bring any of our belongings to the dining area and had them kept in the given lockers, not even our handphones or watches with illumination / glow in the dark function. Instagrammers, sorry! For those who needs to go toilet, its best to have the "passage" clear before entering into the darkness. We were quite excited while the door to the dining area swung open and we were greeted by the service staff. Have you wonder how to walk up a flight of steep stairs in total darkness? Well, we conquered the first stage by having 1 hand tapping to each other shoulder in a line and walk up the stair and into the dining. It all started with uneasiness, getting ourselves up at the dining area. When we reached our table, we were led to the back of the chair and have to figure ourselves to take a seat under the clear instructions of course. We were briefed to locate our cutleries (spoon and fork) and the position to place our drinking glass on the table. With every course served, we was told to lean backwards to our chair as these visually impact servers placed the dishes onto our table accurately. Each course consist of 4 dishes served in a wooden tray and placed in a "t" shape. The rule to dine is to start with the dish nearest to ourselves at the "6" needle base on a analog clock and go clockwise. It was a challenge as well as fun locating the dish and place our spoon correctly into our mouth without dropping off the food, afterall this was my 1st time ever dining under such environment. I vividly remembered that our appetizers consist of rocket salad, foie gras, fried calamari, chick peas, lentils etc. While the mains were duck confit, wagyu beef cubes, cod fish. Meat was tender and tasty. Desserts was lava chocolate, popcorn ice cream, lemon sorbet and strudel. We stood up and walk a few meters on the carpeted ground using the same "tapping shoulder method" in a line before heading back to the stairs. Luckily the stairs were dimly lit and we could see and walk down under the shades of light. As we proceed back to the lounge, our eyes were tired and as though we had just woke up. We were told to fill up a questionaire to recall and guess what we had eaten. After which, the person in charge will come with an ipad, showing the pictures and naming out the 12 dishes we had. We were surprised by our guesses as it really gave our taste buds a good test. All in all, it was a good 1.5 hours session of experiencing the life of a visually impact human, coping with darkness in their moves. We took our 5 senses daily for granted and being in such environment really gave us a good reminder of how lucky we are to be able to see, hear, touch, taste and feel. Not only that, such dining concept keeps us away from the usual social media / electronics distraction we had during our meals with our friends / partners / families. The only disadvantage here I could ever think of is perhaps not to bring someone here for a first date where you cannot see each other. Ha! 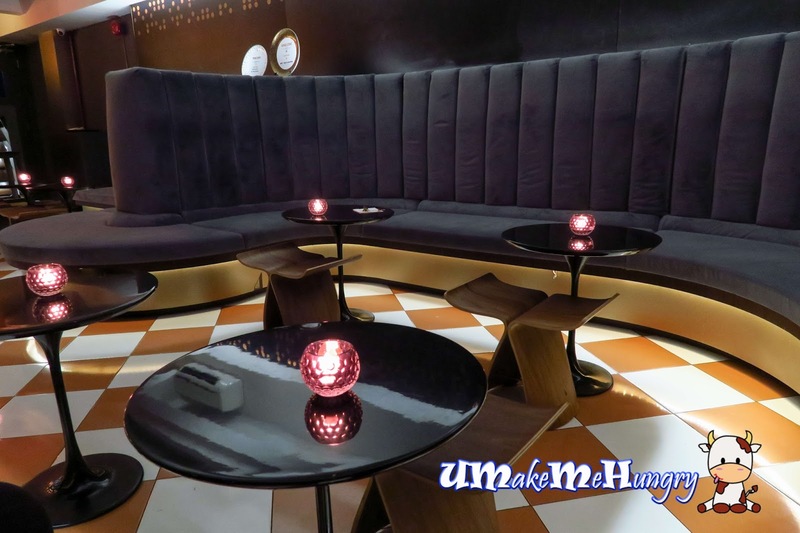 We spent about $120 including drinks per pax and reservation is recommended.